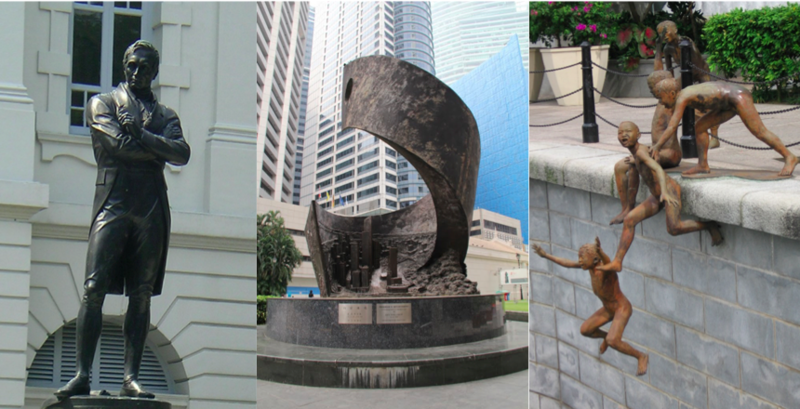 If You Have Seen All These Famous Sculptures In Singapore, You Are A True Blue Singaporean! One of the most famous statues in Singapore, the statue of Sir Stamford Raffles was installed by the 14th governor of the Straits Settlements Frederick Weld (1823-1891) in 1887 to commemorate the 50th anniversary of Queen Victoria’s reign. Originally placed at the Padang, which was believed to be the spot where Sir Stamford Raffles first stepped ashore on the island of Singapore, the statue was moved to its present-day location outside Victoria Theatre and Concert Hall. The work of Colombian figurative artist, Fernando Botero, well-known for his unique style of creating figurines that are rotund and disproportionate. This adorably plump bird which symbolises peace, serenity and optimism, is sponsored by United Overseas Bank Limited (UOB) and stands by the side of the Singapore River. The bird signifies growth and prosperity for Singapore in years to come. Showing a detailed Central Business District (CBD) by the Singapore River, this 4m-tall sculpture is the work of Yang-Ying Feng. Standing at the heart of Singapore’s financial hub, it signifies the progress and advancement of Singapore’s financial sector. It was donated on 8th August 1988 by local entrepreneur and founder of Overseas Union Bank Limited (OUB) George Lien Ying Chow (1907-2004). This work by Chong Fah Cheong transports us back to the early days of Singapore where children frolicked by the Singapore River, indulging in tree climbings and river jumpings. In 1983, the Clean Rivers Project was launched, moving families and hawkers inland, and that marked the end of such simple entertainment. Created by Taiwan-born sculptor Chern Lian Shan who began calling Singapore his home in 1980, “Fishing At Singapore River” is one of his many works which depict life in Singapore before the colonial times. Before the arrival of the British, the native Orang Laut, or sea people, plied their trades as fishermen on the Singapore River. With the growth of the city, the river became so polluted all fishes disappeared from the river. This was reversed gradually with the launch of Clean Rivers project in the 1980s. One of Aw Tee Hong’s creations, this cluster of sculptures shows coolies loading goods onto a bullock cart while Scottish Alexandre Laurie Johnston, one of the most well-known merchants of the early days, engaged in negotiations with a Chinese trader and a Malay chief. The present day Maybank tower, where Johnson set up his company, was the nearest to the mouth of Singapore River and was in a prime position to catch the merchant captains as their boats entered the river. This group of sculptures were built in rememberance of how the 1st and 2nd Battalion of the Malay Regiment defended Bukit Chandu in the Battle of Pasir Panjang in 1942 during the Japanese invasion. Malay lieutenant Adnan bin Saidi (1915-1942) led his troops against the Japanese and fought bravely despite being heavily outnumbered. He was caught, tortured and killed. Sacrificing their lives to defend their country, these heroes will forever be remembered. Laid in the Botanical Gardens, you can find the magnificent, thought-provoking bronze sculptures by famed Taiwanese sculptor Ju Ming. Installed around the Eco Lake, in the section of the gardens closer to Bukit Timah, these sculptures belong to the Taichi Series, majestic expressions of the Chinese meditative exercise. The sculptures known as “Another Day (The Coolies)” are bronze depicting two manual workers of bygone days sharing a meal are display at the Singapore Art Museum. Have you seen all of these sculptures in Singapore? Let us know in the comments below!